Alan Irwin celebrates his son Glenn's victory in the Sunflower Trophy race on Saturday at Bishopscourt. It was a real family affair at Bishopscourt in Co Down on Saturday, where former Sunflower Trophy winner Alan Irwin was on hand to witness his son Glenn winning the famous accolade for the first time. The British Superbike prospect, who finished on the podium twice in his rookie year in BSB on the PBM Be Wiser Ducati, added his name to the roll of honour alongside his father, who won the trophy in 1982 and 1986 at Aghadowey. “Obviously my dad has won the trophy before so it’s nice to have finally done it myself,” Irwin said. Andrew Irwin won both Supersport races on the Gearlink Kawasaki on a proud day for Irwin Snr. Ulster road racing legend and five-time world champion Joey Dunlop was the inaugural winner of the Sunflower Trophy race in 1977. The Ballymoney great lifted the spoils for a second time in 1978. Other famous winners include Steven Cull, Jamie Whitham, Brian Morrison, Jim Moodie and Steve Hislop. 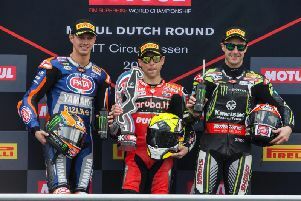 More recently, Michael Laverty dominated the event with a record six wins while World Superbike champion Jonathan Rea reigned supreme in 2006. English rider Danny Buchan won the trophy for two years running in 2014 and 2015.